You’re so excited to see your little ones go off to school in the morning, but what about when they get off the bus with their clothing covered in crayon? Did the teacher even bother handing out paper or did they just instruct the kids to draw on their clothes? Well never fear, crayon stains are easy to remove from clothing. At first you might be tempted to scrape the crayon off the fabric, whatever you do, don’t do that! Scraping crayon is the equivalent of rubbing, it will spread the stain and help to work the crayon deeper into the fabric. Soak the are of the crayon stain in liquid laundry detergent. Saturate the area well, and then allow it to sit overnight. Launder the clothing normally, checking the pockets for any extra crayons that might get ruined in the wash.
Next time you catch your kids with crayon stains on their clothes, don’t stress. 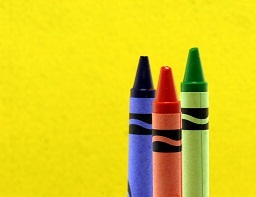 Removing crayon stains is so simple you won’t need to give it a second thought.